Students can choose from 50 majors, or create their own. See entire list here. In the College of Arts and Sciences, the student-to-faculty ratio is 11:1 and 73% of Oberlin classes have fewer than 20 students. 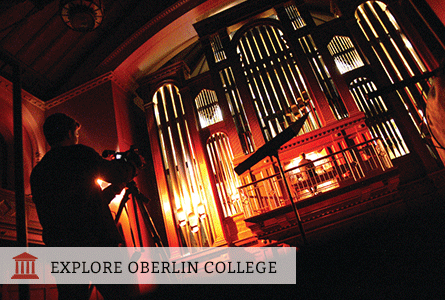 Oberlin offers a unique Double Degree program that allows students to receive both a Bachelor of Arts from the College of Arts and Sciences and a Bachelor of Music from the Conservatory of Music. Winter term is a 4-week period in January when students continue the process of personal and academic discovery outside of the confines of a classroom. Students dive into individual projects or group endeavors that take place across the globe. Students interested in engineering can participate in a five-year 3/2 Engineering program which allows students to earn a Bachelor of Arts from Oberlin and a Bachelor of Science from one of four schools: Case Western, Caltech, Columbia, and Washington University in St. Louis. With advising through a Premed program, Oberlin science majors are accepted into medical school at a rate twice the national average. More than 75% of students study away. The Allen Memorial Art Museum allows students to rent one of two works of art for five dollars each semester. Art Rental pieces include works by Picasso, Rembrandt, and Warhol. Peer Advising Leaders (PAL) Program aims to create a sense of community among first-year students and help them make the most of their first-year educational experience.